A-HOTEL.com - Luxury and cheap accommodation in Trudovoye, Russia. Prices and hotel, apartment booking in Trudovoye and surrounding. Located in Sol'-Iletsk, Hotel U Zakarii provides air-conditioned rooms with free WiFi. Featuring free shuttle service, this property also provides guests with a barbecue. Квартира "Двушка" is set in Sol'-Iletsk. This apartment provides accommodation with a balcony and free WiFi. Providing free WiFi, Hotel Volga is situated in Sol'-Iletsk. This 3-star hotel offers a 24-hour front desk and a shared kitchen. Offering a barbecue and views of the lake, Hotel "Na Sadovoy" is set in Sol'-Iletsk. Each room at this inn is air conditioned and is equipped with a flat-screen TV with cable channels. Hotel Lada offers rooms in Sol'-Iletsk. With free WiFi, this 3-star hotel offers a 24-hour front desk and a shared kitchen. Hotel Raduzhnaya provides rooms in Sol'-Iletsk. Among the various facilities are barbecue facilities and a terrace. Полина is set in Sol'-Iletsk. All units feature air conditioning and a flat-screen TV. Set in Sol'-Iletsk, Hotel A-3 features barbecue facilities, terrace, bar, and free WiFi. All rooms boast a kitchen and a private bathroom. 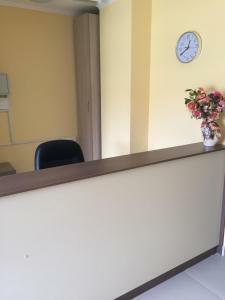 Гостиница "Элеон" is offering accommodation in Sol'-Iletsk. Both private parking and free WiFi are accessible at this property. Квартира посуточно в г. Соль-Илецк is located in Sol'-Iletsk. Premyera Inn is set in Sol'-Iletsk. Free WiFi is available. House and individual rooms in salt-Iletsk in Sol'-Iletsk features barbecue facilities and a garden. Both private parking and free WiFi are available at this property. Situated in Sol'-Iletsk, Na Komsomolskoi provides barbecue facilities and terrace. Featuring a 24-hour front desk, this property also provides guests with a children's playground. Razina 29 is situated in Sol'-Iletsk and has barbecue facilities and a garden. Free WiFi is available. Offering free WiFi, Aleksandria Guest House is located in Sol'-Iletsk. Featuring a shared kitchen, this property also provides guests with a barbecue. Featuring massage services, Guest House Chocolate is set in Sol'-Iletsk and also provides barbecue facilities and a garden. Boasting free shuttle service, this property also provides guests with a children's playground. Guest House Olga has barbecue facilities and a garden in Sol'-Iletsk. The accommodation offers free WiFi. Located in Sol'-Iletsk, Guest house Evelina features air-conditioned rooms with free WiFi. Among the various facilities of this property are barbecue facilities and a terrace. Situated in Sol'-Iletsk, Guest House on Gatchinskaya offers barbecue facilities. Among the various facilities of this property are a garden and a terrace. Boasting air-conditioned accommodation with a balcony, Apartment on Amurskaya 8 is set in Orenburg. This apartment offers accommodation with free WiFi.